RENO, Nev.-Wily Mo Peña went three-for-five with two runs scored, but Colorado Springs used a six-run eighth inning to hand Reno its first home loss of the season, 8-5, on Sunday afternoon at Aces Ballpark. Reno took a 3-2 lead into the eighth, but the Sky Sox exploded for six runs in the frame off three Aces relievers to take a commanding 8-3 lead. Colorado Springs used five hits, two walks and a sacrifice fly in the eighth inning to take the lead, and held on for their first win of the series. Reno rallied in the ninth, scoring two runs and bringing the potential tying run to the on-deck circle, but Andrew Johnston got Konrad Schmidt to ground out to end the game. Aces starter Matt Torra did not figure in the decision, after allowing just two runs-one earned-over six innings of work while fanning three. Tom Layne (1-1) was tagged with the loss for Reno. Sky Sox reliever Jim Miller (1-0) earned the win, tossing one scoreless inning in relief of starter John Maine, who went the first six innings and allowed three runs. 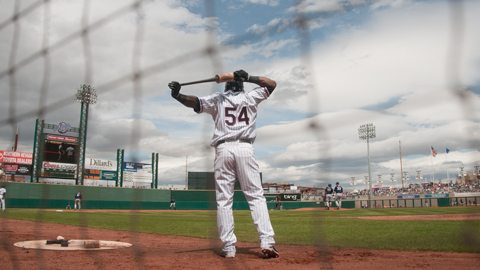 In addition to Peña's three-hit afternoon, Cody Ransom added two hits and drove in two for the Aces. This afternoon marked the inaugural Renown Children's Hospital Family Funday, which included the first rendition of Renown Baseball Bingo, where fans had the opportunity to play baseball-themed bingo throughout the game. In all, 76 fans won a Reno Aces replica jersey by "blacking out" their bingo cards based on events that occurred during the game. Reno and Colorado Springs conclude this four-game set on Monday night at 6:05 p.m. at Aces Ballpark. Reno RHP Micah Owings (1-0, 1.80 ERA) will get the nod, and will be opposed by Sky Sox RHP Clayton Mortensen (0-1, 24.75 ERA). All Reno Aces tickets can be purchased at the Aces Ballpark Box Office, online at www.RenoAces.com or by phone at (775) 334-7000. Discount full and partial season ticket plans are available today. Visit www.RenoAces.com or call (775) 334-4700 for more information.